Suddenly, 13-year old Josh (David Moscow) is transplanted into a 30-year old body (Tom Hanks). Now living life as an adult, Josh must get a job, pay for an apartment, and make new friends- most of all in the arms of corporate-ladder-climbing Susan, an unhappy middle-aged woman who finds her own “inner child,” so to speak, in a relationship with him. Josh finds success as a toy designer (naturally) and finds equal success as a lover. But ultimately, with the help of childhood best friend Billy, Josh remembers that the adult life and the ladder he's climbed is just a convenient lie and that his real place is home, playing stick ball, riding bikes and singing “shimmy shimmy coco puff” with his buddies. Once again at the Zoltar machine, his wish is granted: “I want to be a kid again.” The transformation takes place as he walks down the street toward home- all to the swelling accompaniment of strings. A touching ending to this fantastic story. 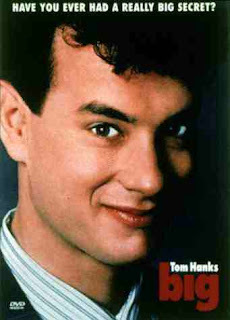 Tom Hanks is brilliant, the writing is fantastic, the music will make you want to cry, the message is profound... Remembering my disclaimer, I must say this is one of the GREAT movies of our generation. If it's been a while, you really should watch it again.